A few weeks ago I took a bit of break from work and all things Exchange and sat down to write what I call some “self help tools”. In essence, every now and then I write small utilities to make laborious administrative processes easier to manage. 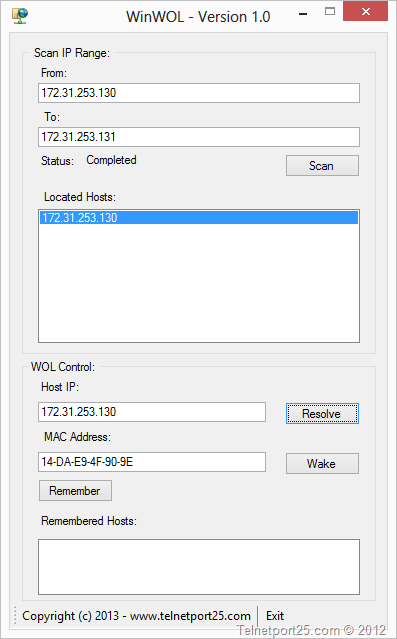 One such tool that I needed was a simple “Wake on LAN” application. I won’t bore you will all the details; but suffice to say I have a large amount of machines to turn on each day and by having a “point and click” list would make things far easier for me. The other reason why I wrote the tool, was because I wanted to spend sometime writing an application in an area which I do not normally focus on. I was quite pleased with the end result, so I decided to put it up on the site for download should anybody else wish to give it a try. Windows Vista, Windows 7, or Windows 8 (x32 or x64). The WOL features enabled on the relevant hosts network card (this is often enabled within the BIOS of the destination computer – please refer to your manufacturer’s user guide for further information). In order to use the network discovery features of WinWOL – all the relevant endpoint clients which you intend to “Wake UP” should allow ICMP traffic from the management machine (e.g. the machine where you have installed WinWOL). The tool can be used WITHOUT the network discovery, but you will have to MANUALLY enter in IP and MAC addresses for your endpoints. You can download the WinWOL tool from the following location. You can download the WinWOL user guide from the following location. Not had a chance to try this yet, but it looks great! You really are a jack of all trades. Do you have any recommended resources on learning to code in .NET? Anyhow, I use MSDN quite a bit, and of course there is http://www.codeproject.com/. I also make heavy use of StackOverflow.com which has a great forum for C# (and others).